Unimak Korea is located in Busan, the largest port in South Korea. 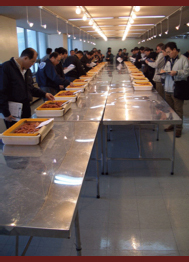 Marketing seafood and organizing pollock roe auctions are our specialty. We also oversee the transshipment of frozen and dry cargo, provide technical assistance for vessel port calls, and supply provisions and supplies to the North Pacific fishing fleet. For sales and logistics please get in touch with Ms. Isadora Chang.